A giant tooth? A weirdly shaped bone or rock? 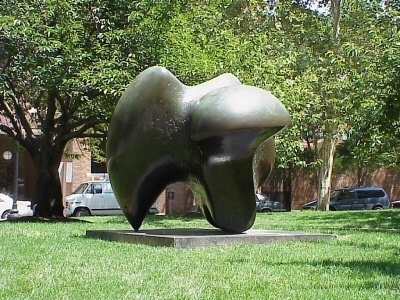 Henry Moore’s chubby, one-ton bronze, poised on three delicate points, suggests different interpretations from different angles. Both prolific and highly respected, Moore has been called the most influential sculptor of the 20th century. "There are three faithful friends: an old wife, an old dog, and ready money". Ben Franklin. From the Philadelphia Almanac and Citizens' Manual.